E.T. from E.T. The Extra-Terrestrial! And now onto this month’s header. As always you need to be looking at the figure on the far left in either the picture below or the header above. Once you know who it is then just head on over to here and make your guess! 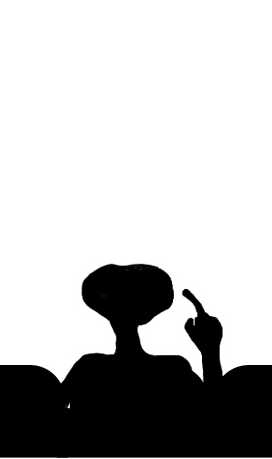 Tags: Characters, E.T, film, Movie, Quiz, Silhouette, Who's That? Yay! 🙂 I think I’ll get it right this month as well. Already submitted my guess. Just letting you know the new guest appears in the header but not in the image you included in the post. Yay! And I think I’ve got this month as well. Thanks for the honorable mention, and awesome header you have there! Hmmm, I think I have an idea but I have a feeling I’d be wrong, ahah. Well you’ve got a few weeks to think it over! It’s always interesting to see the misinterpretations that people have actually.